We tried to ignore their conversation, but it was so familiar. Not the “late to dinner” part. It was those phrases “you always,” and “you never” that clanged so loudly. As senior pastors for thirty-five years and now ministers-at-large, we’ve counseled our share of couples. Most folks know that poor communication is the greatest source of problems in marriages. Few realize that small changes can make drastic improvements in their communication resulting in greater marital harmony and less stressful daily life. 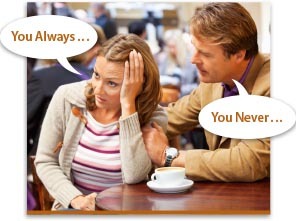 Two of the most abused phrases in English are “You always” and “You never.” The worst thing about using them is that they are usually inaccurate. It’s seldom true that a person “always” or “never” does what he is accused of. As a result, the person who hears those words immediately responds internally by thinking of the exceptions to the accusation. Instead of hearing the heart of the person, he prepares to defend himself. Furthermore, we usually don’t realize that when we say, “You always” or “You never” we are, in fact, using a tactic of Satan, for, “The accuser of our brothers … accuses them before our God day and night,” (Revelation 12:10 NIV 1984 throughout except where noted). How much better if we look for ways of expressing ourselves by beginning with the words, “I feel.” Feelings are neither right nor wrong. They may not even be based on fact. Feelings are real and cannot be argued with. We can feel lonely in a crowd. A wealthy person can feel as though he doesn’t have wealth. A beautiful person can feel plain or even ugly. Their feelings cannot be disputed. They are real. Most emotionally healthy people who learn of another person’s negative feelings want to help alleviate those feelings. Especially with those we love, we want them to feel safe, secure, and happy. If we will stop long enough to get in touch with our feelings, then put those feelings into words beginning with “I feel,” we can more readily be understood and get our needs met. A husband whose wife says, “I feel lonely,” will more likely look for ways to make time for her than if she complains of being neglected. One big problem with this concept is that most men have been taught from childhood to hide their feelings. Many men have conditioned themselves not to feel except for the feeling of anger. As a result anger is what they express when they are threatened, when they are unable to identify their feelings, and even when they are fearful. A man might see that others are being laid off at work and he fears he might be the next to lose his job. Believing he must be strong, he doesn’t share his fears with his wife. When something disrupts the peace at home he lashes out in anger, maybe at his wife or his child. The fear is the true feeling, masked by anger. There are thousands of words in the English language that describe emotions. If we stop and think about what we’re truly feeling, we can more accurately express them and deal with them. In a quick internet search I found more than a dozen articles and lists of emotions we humans can experience. Perhaps it’s time to get in touch with those feelings and communicate about them to our spouse. When seeking to improve our communication skills it pays to stop and think about the source of our words. They don’t start in our head. Rather, they start in our heart; and they reveal the contents of our heart. Our heart is like a garden. God wants us to till the soil and prepare it, through prayer and Bible reading for his work in our lives. The Holy Spirit is standing ready to provide the seeds for the good that our lives are meant to produce. If we allow Satan to plant weeds of negative, evil and judgmental thoughts in the garden of our heart, those will choke out God’s seeds. We can test what is growing in our heart’s garden by the light of God’s Word: “Whatever is true, whatever is noble, whatever is right, whatever is pure, whatever is lovely, whatever is admirable, if anything is excellent, or praiseworthy, think about such things” (Philippians 4:8). “For the mouth speaks out of that which fills the heart” (Matthew 12:34 NASB). God does not take lightly the way we speak. We “will have to give account on the day of judgment for every careless word [we] have spoken” (Matthew 12:36). Most of us have lived in a state of competition much of our lives, competing with siblings, playmates, classmates, and colleagues. As a result, we tend to view even our conversations with friends and family from a win or lose standpoint. By approaching conversation with a competitive attitude we build barriers that prevent open exchange. The goal of our communication should to be to gain understanding of the other’s ideas and to make our own thoughts known to the other, not to come out a winner. God has provided the greatest help available for overcoming communication problems. The first person to recognize communication difficulties simply needs to suggest, “Let’s stop and pray together.” This can be done in the home, or when the family is at play together. It works in church settings and in other gatherings of Christians. If in a public setting such as a restaurant or a park where a normal prayer mode might be awkward, we can merely address the Lord with our eyes open. It is always appropriate to take the time to bring God into a conversation and ask for his help in our communication. Beverly Caruso, and her husband Pete, have served the Lord together for over 50 years. The above article was adapted from her book, God’s Gift of Friendship: Tools for Improving Relationships. The Caruso’s recently coauthored Keeping It Fresh: A Love that Keeps on Growing based on the Marriage Enrichment Seminars they team-teach. They can be contacted at: Caruso@across2u.com. Or visit their website: www.PeteandBevCaruso.com.